Shelby by 1969 had actually decamped from his Los Angeles airport factory, the airport harassing him because he was using airport property without having airplanes (they ignored his “gooney bird” DC3) So Mustangs bearing the “48″ series i.d. numbers usually went to the firm Ford contracted to make Shelbys, A.O. Smith Company in Southfield, Michigan. However, the researchers at various Shelby clubs have determined that this particular car — 9F02G482244—was diverted to Kar Kraft, a Ford-owned mini-factory that did special projects, such as building (in ’64) the Ford Thunderbolts or later, the Boss 429s. A “999″ report from Ford’s Customer Assistance Center revealed that this ’69 Shelby GT350 was built with the following equipment: a 302 H.O. engine, a close-ratio four-speed transmission, a 3.50 Traction-Lok differential, power front disc brakes, an Acapulco Blue exterior paint, knitted high-back bucket seats, F60 x15 tires, a rear sports deck, the deluxe appearance group, an AM/FM multiplex radio, tinted glass, deluxe seatbelts, racing mirrors, a heavy-duty battery, and a tachometer with a 140-mph speedometer. 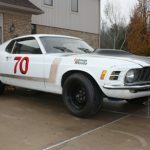 This entry was written by by Wallace Wyss (67mustangblog) and posted here on Wednesday, January 8th, 2014 at 8:16 am and is filed under 1969, boss, boss 302, News. This article was not written by us, rather gathered using RSS feeds listed here. We take no credit for this article. You can leave a response, or trackback from your own site.